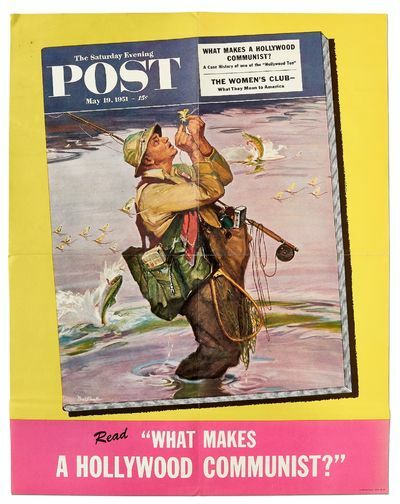 viaLibri ~ (Poster): The Saturday Evening Post May 19, 1951: What Makes A Hollywood Communist? A Case History of one of the "Hollywood Ten"
(Poster): The Saturday Evening Post May 19, 1951: What Makes A Hollywood Communist? A Case History of one of the "Hollywood Ten"
[New York? ]: The Saturday Evening Post, 1951. Near Fine. Poster. 21.5" x 28". Old folds as issued. Slight rumpling and soiling, near fine. Poster features an illustration by Mead Schaeffer of a man baiting his fishing rod as fish jump blithely around him. Feature article on a Hollywood Communist, with another article on: "The Women's Club - What They Mean to America."